This calcinated alpha hemi hydrated plaster of maximum purity and very creamy and white color is appropriate in the manufacture of plaster bandages. 500 Kg/cm2 using a rate of 40 cc water with 100 g powder. 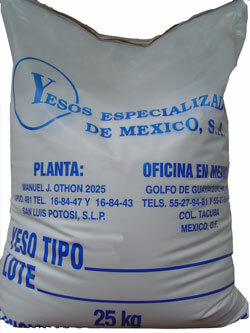 25 Kg polyethylene bags. It is made in white. Used in orthopedic plaster bandages.